It is time to welcome Spring. There is happiness in the ambience and the atmosphere is all colorful. Everybody has already started to bounce off the walls and prepare for Holi. After all, it is one of the most awaited festivals and people are all set to fling themselves into the celebration mood. The festival of colors not only encourages the feeling of brotherhood and peace among all but also sparks the spirit of enthusiasm and energy. The people raise the toast to the occasion in several different ways. From the traditional, custom-based ceremony of playing with colors, to the modern bhaang-lassi and sometimes alcohol trance in the urban cities, the essence of this festival has changed with time. Although, as said before, there are many ways which can amp up the "rang and pichkari" atmosphere, it strictly depends on what kind of fun you are looking forward to. For starters, the one and only place that pops into our heads (with respect to the traditional holi) is Mathura-Vrindavan Holi. The custom is to begin the celebration a week before and the conclusion takes place on the D day. The nandlalas and the gopis from Nandgaon amd Mathura, respectively, play with colors. The events are more or less in an apple pie order and people absorb themselves in the intoxicity of bhaang and thandai. Warrior holi! Ever heard of it? Well, this is the kind of holi played by the ghabroo jawaans and it definitely is the one that can blow away the cow-webs. The punjabis of the north do not use colors and water as their props, but instead they put out a show of strength, agility and enthusiasm. They indulge in fights (not the real ones though) and games. They showcase the stamina and competence of men by organizing sports like wrestling, military drills and sword fights. If you plan on enjoying the festival with somber music and delicate surroundings, then the right destination for you is West Bengal. Here the festival is celebrated with a mix of Chao dance, Natau dance and the Darbari Jhumur. The function begins three days before the main day and each day something new is done to feast your eyes on something beautiful and enjoyable. West Bengal offers melodious folk music as well as mouth watering delicacies that also provide the opportunity to participate in the holi celebrations by the tribes. 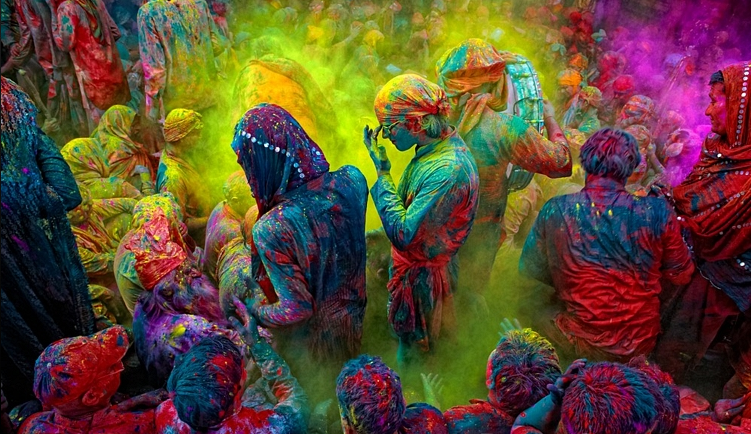 If still not satisfied, then you are definitely made for Techno Holi- the one that is played mostly in Delhi. This celebration begins a day before and the traditional Bhaang and Thandaai is generally replaced by Liquor. On the main day, the people dance their heads off on the music, get drunk and to add icing on the cake, get indulged in marijuana parties too. With changing time, the lifestyle of the people has also changed and holi is no longer is holy. The festival revelry has now taken up new hues in terms of less expensive colors, more of indoor affair, more clamorous and vociferous ambience and modern celebrations. People do not want to mingle with others. Rather they prefer keeping to themselves. In the name of colors, the chemicals are being sold. However, the trend of not moving out the houses during the peak hours, because of the fear of rowdies on the road, ready to throw cowdung and dirty water on every other passerby, still remains. Breaking the ice has become difficult. Even if people gather at some place, there is lack of attempts made to break the social barriers. Moreover, the additional economical burden on the families also restricts them from enjoying themselves. But we all know that eventually the vital spirit of festival will definitely find a new form of expression. For those, who like to get drenched in colored water, with their face painted in dark colors and pinks and violets visible in the partings of their hair, it is time to get ready. While for those, who like to spend Holi, in their soft cozy house, it is completely their call. So folks, here is wishing you colourful and memorable Holi. Let the colors bring joy and happiness in your lives.